I’m excited about Facebook hashtags. There are very real opportunities for marketers to use hashtags, assuming Facebook doesn’t screw it up. Facebook hashtags, in their current form, are flawed. 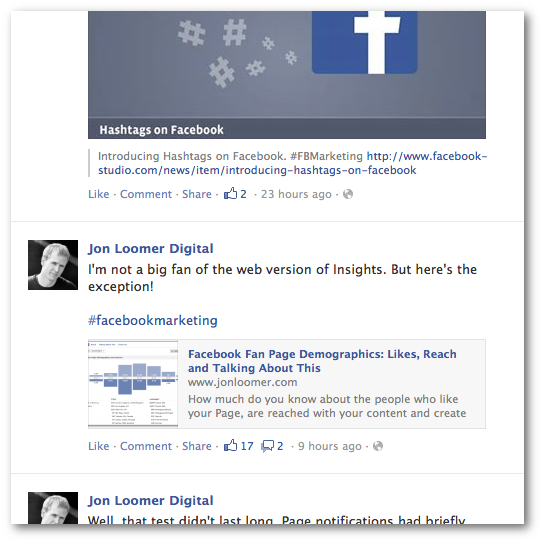 Like everything Facebook rolls out, the hashtag is an incomplete product. It’s far from perfect. Hopefully Facebook realizes the most important problems with hashtags and addresses them quickly. Otherwise, they’re dead in the water. Here are the four things that Facebook needs to fix fast, or hashtags will never catch on. I’ve gotta admit that it’s not entirely clear how Facebook orders results in hashtag feeds. And that’s an immediate problem. It appears that the items at the top are usually most recent. But they aren’t always. And the further you scroll down — apparently once you scroll past the most recent day — you’re more likely to run into posts out of order. As you can see, the post at the top was 23 hours ago and the next item is nine hours ago. There are actually many examples of this deeper into the results. Is Facebook filtering content in the same way they filter my News Feed? If so, this completely defeats the purpose when using hashtags for discovery. Facebook will bury or possibly hide some content from the feed results, depending on the user looking at them. This presents a problem beyond discovery. 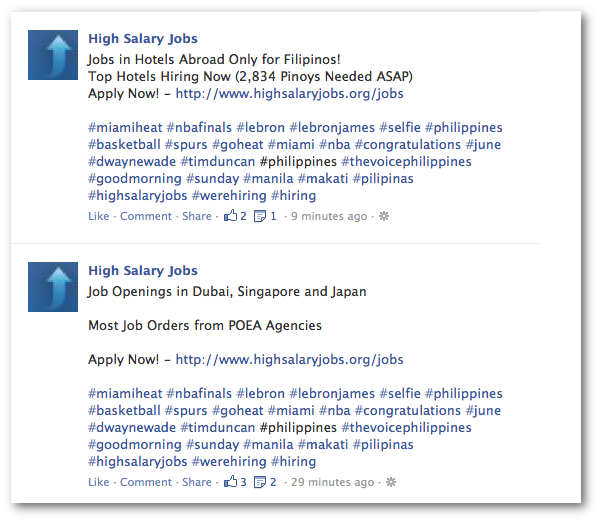 If real-time results are filtered, Facebook hashtags are worthless for breaking news and following sporting events. If the results aren’t in order for a sporting event, they lack context for the reader. It becomes a confusing mess and eliminates one of the biggest reasons hashtags are so interesting on Twitter. Dozens and dozens of these irrelevant spam posts. Of course, spam isn’t a problem unique to Facebook hashtags. They exist on Twitter, too. But the relevant posts on Twitter far outnumber the spammy ones, retaining the value. Hashtags will never catch on if following them doesn’t provide value. Either Facebook needs to do something to limit the spam (I assume the spam reporting function still applies here) or Facebook needs to make a push to increase relevant use of them. If you see a hashtag on your mobile device, it’s just ugly, plain text. 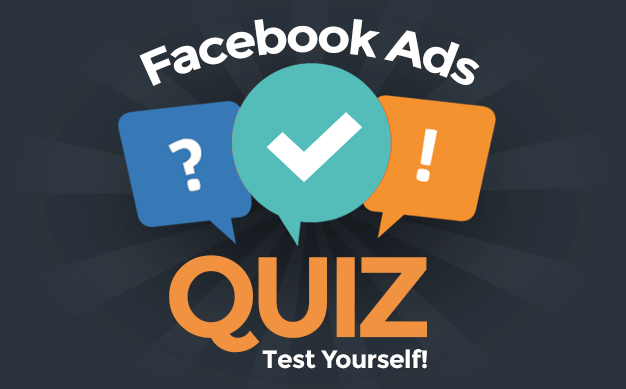 More than half of users access Facebook from their mobile device. More than half of Facebook users can’t click a hashtag. I understand that this is what Facebook does. They roll everything out in stages. Mobile is often last. But this is getting ridiculous. You can’t get traction on a new feature if mobile continues to be an afterthought. Facebook keeps telling us that mobile is a priority. But rollouts like this one make me wonder just how true that is. I use hashtags in my posts. But I almost never follow hashtag feeds. This is a problem. If everyone is using hashtags without anyone following the feeds, it completely defeats the purpose of using a hashtag in the first place. 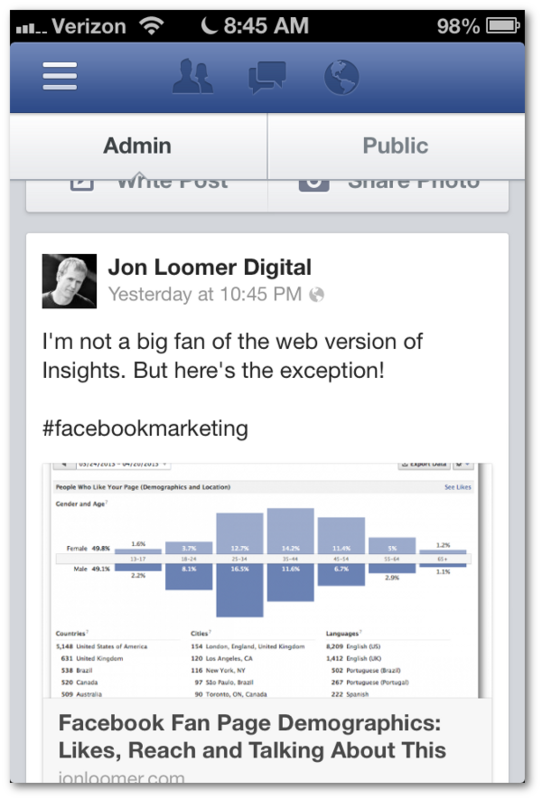 A big reason for this is that Facebook has not integrated an easy way to do follow hashtags into the interface. An easy solution would be to add the ability to favorite a hashtag feed, similar to how you can favorite an interest list. One has to assume this will be part of the new Facebook News Feed. What other problems do you see with Facebook hashtags? Do you think they’ll eventually catch on and be valuable?